.she says it's like a brain! he must be a clever bloke to have a brain that size! 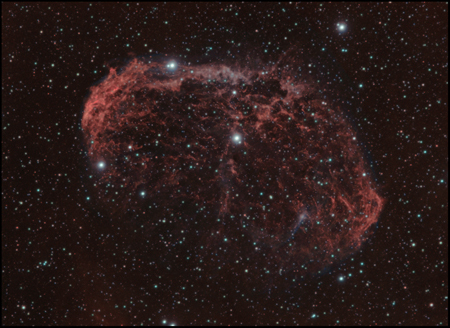 NGC 6888, the Crescent Nebula, very near to Sadr in Cygnus is thought to have started formation about 250,000 years ago. The central star is very massive, and has a solar wind so strong it has blown off roughly the same mass as the sun every 10,000 years. This wind has collided with gas that had been shed by the star in a series of shells in the past, and the wind has heated it and caused to glow. At a distance of about 4700 light years, the light that those of us who've imaged or viewed this have just received left at a time that saw the start of the bronze age, the beginning of writing and the spread of agriculture. World population was between 7 and 14 million. Imaged on the 30th May & 2nd June 2009 from Dorset. H-alpha is used as luminance. OIII 24 x 6 minutes binned 2x2.